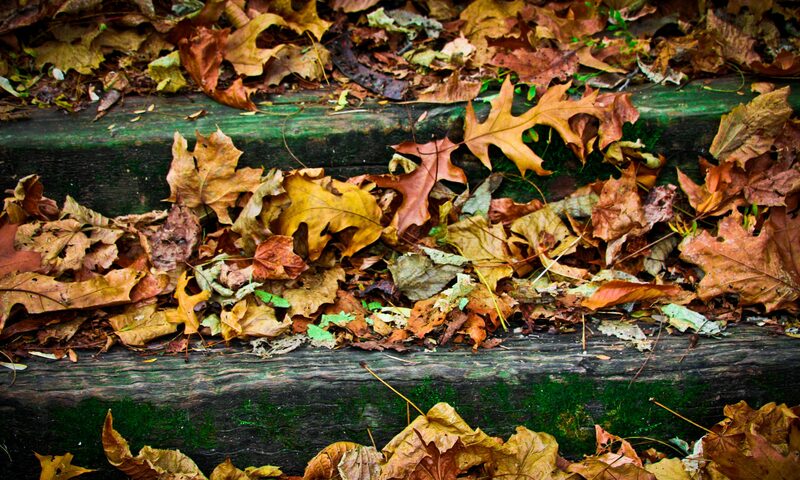 Perhaps it has something to do with the large percentage of farmers and coal miners in my own family history that explains why the wills that I find are few and far between or, perhaps, I just have not found them all yet…but I do love to find a good will! Some will are better than others as far as the information that they give up. Some are crazily vague – “…bequeath to wife…” with no mention of her name! Ugh! There are times when I’m browsing through the wills and probate records at familyserach.org, I’ll just read through other wills that might catch my eye, even if they don’t belong to my family. That might make it seem as if I have too much time on my hands, but it’s refreshing to just back away from my own research at times. Sometimes, I even stumble upon information that helps me a lot with my own research. 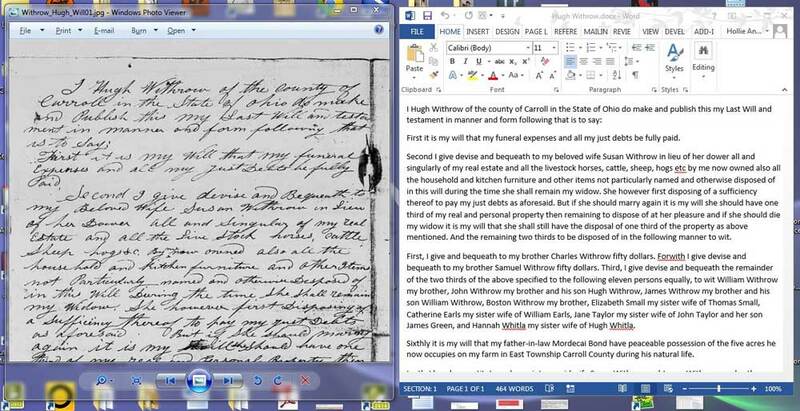 I haven’t been able to find a will for David Withrow, but I did find this will of his son, Hugh. It’s a great will because he gives up so much genealogical information. And this is why Hugh’s will is so wonderful. Second I give devise and bequeath to my beloved wife Susan Withrow in lieu of her dower all and singularly of my real estate and all the livestock horses, cattle, sheep, hogs etc by me now owned also all the household and kitchen furniture and other items not particularly named and otherwise disposed of in this will during the time she shall remain my widow. She however first disposing of a sufficiency thereof to pay my just debts as aforesaid. But if she should marry again it is my will she should have one third of my real and personal property then remaining to dispose of at her pleasure and if she should die my widow it is my will that she shall still have the disposal of one third of the property as above mentioned. And the remaining two thirds to be disposed of in the following manner to wit. First, I give and bequeath to my brother Charles Withrow fifty dollars. Forwith I give devise and bequeath to my brother Samuel Withrow fifty dollars. Third, I give devise and bequeath the remainder of the two thirds of the above specified to the following eleven persons equally, to wit William Withrow my brother, John Withrow my brother and his son Hugh Withrow, James Withrow my brother and his son William Withrow, Boston Withrow my brother, Elizabeth Small my sister wife of Thomas Small, Catherine Earls my sister wife of William Earls, Jane Taylor my sister wife of John Taylor and her son James Green, and Hannah Whitla my sister wife of Hugh Whitla. 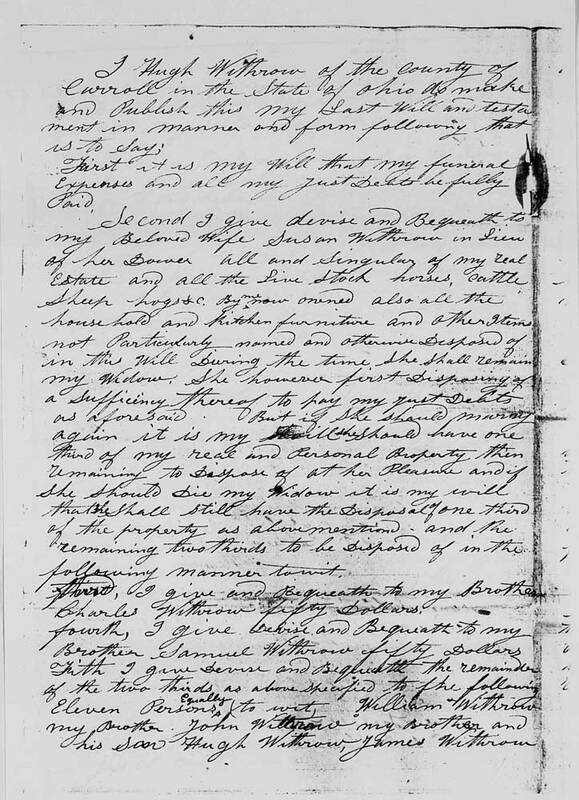 Sixthly it is my will that my father-in-law Mordecai Bond have peaceable possession of the five acres he now occupies on my farm in East Township Carroll County during his natural life. Lastly I hereby constitute and appoint my said wife Susan Withrow and James Withrow, my brother Jonas Lumm and James A. Ball to be the Executers of my Last will and testament revoking and annulling all former wills by me made and ratifying and conforming this and no other to be my Last will and testament. In testimony whereof I have hereunto set my hand and seal this eighteenth day of February A.D. eighteen hundred and forty one. The first thing that impressed me is that he has given everything to his wife as long as she’s his widow and that if she does remarry, she still gets to a keep a third and to dispose of that on her death as she wishes. He also names his father-in-law. Which gives us his wife’s maiden name. And then, bless his heart, he names all of his brothers and sisters and who the sisters are married to. This helped me to list David and Elizabeth’s children. This is so important while piecing together the family considering that all or most of their children would have left home by the time of the 1850 census and a name was noted for everyone in the household. Since Hugh doesn’t list any of his own children, we have to assume that he either had no issue, or that there were no surviving children. This will also helped me fill in a blank that I had concerning Hugh Whitla in connection with my Hackathorn family providing me with his wife, Hannah’s, maiden name. So even though we don’t have David’s will, his son has kindly presented us with a lot of information on David’s family. David Withrow is my 5th great-grandfather on my mother’s side. I had written a post earlier this year about his wife, Elizabeth, and how I didn’t know what her maiden name was. This is something important to me because she is in my direct matrilineal line and I’d kind of like to get past her. I was contacted shortly after this blog post by a cousin who shares these 5th great-grandparents and have received some good hints, like that Elizabeth might also have gone by the name of Isabelle according to a short biography on one of David’s grandsons (and in his direct line) in a Richland County source. (Thanks, Randy!) Acting on that tip, I started looking at the children of David and Elizabeth to see what they’d named they’re children. Any named after their grandparents? Why, yes! Daughter, Hannah, gave birth to a daughter named Elizabeth I. Whitla. Son, James, had a daughter named Elizabeth and another daughter named Isabell. Son, Samuel, named a daughter Isabell. This looks to be like more than a coincidence. So at this point in time, I am searching for an Elizabeth Isabel, or perhaps an Isabel Elizabeth. David married his second wife, Catherine Morrison, on 28 December 1824 in Columbiana County, Ohio. I’m assuming that Elizabeth passed away sometime between the birth of her last child, Boston, born 1817 in Beaver Falls, Beaver County, Pennsylvania and David’s marriage to Catherine, so to find her death date is also on my list of things to research. 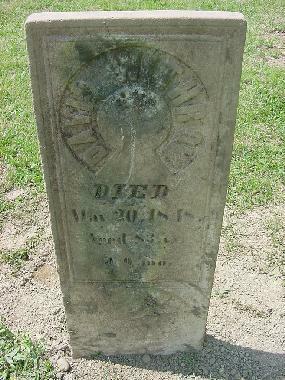 David and Catherine are buried at Glade Run Cemetery in East Township, Carroll County, Ohio. Also on the research that needs to be done list is finding David Withrow’s parentage. We know that he was in Beaver County, Pennsylvania before moving to Columbiana (now Carroll) County, Ohio, because we find his name on a petition – along with that of Charles Phillis and that of Jacob Hackathorn. by the Excessive Largeness and Extensive bounds of said Township. . Honors may appear most practicable, &c.
Edward Neville, Solomon Carlile, John Hampton, Wm. Steel, Saml. Martin, H. Johnston, Jonathan Grant, James Kennedy. 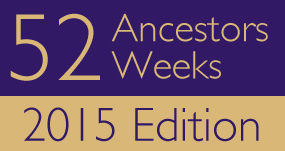 That’s the one thing that you can count on with genealogy…there’s always something else that needs to be found out. And there are always new ways to work that make life easier for us. What are some of your favorite tricks for working with old manuscripts? Please share in the comments. The optional theme for this week was “Where There’s a Will”. Hollie, great post! 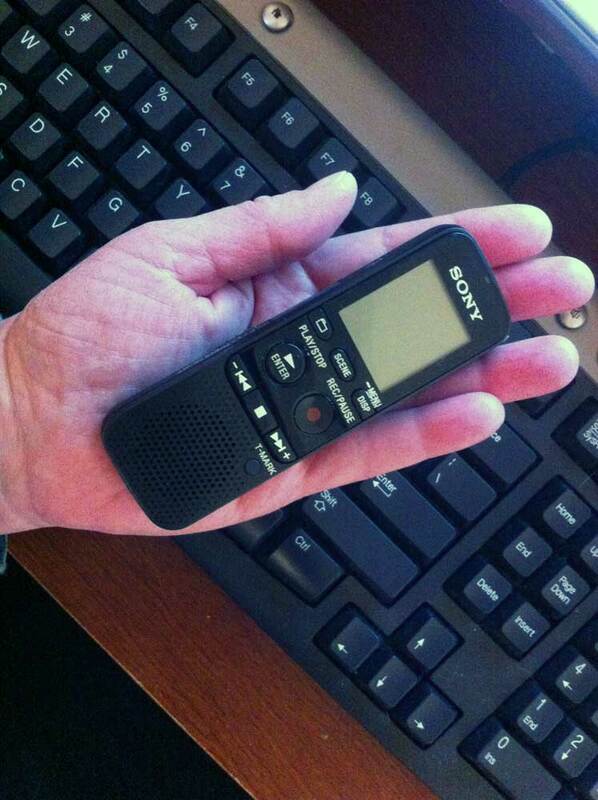 I love your idea of using a little digital recorder to transcribe script. I usually split my screen with the handwritten doc on one side and word processor on the other side. I also have Transript. It splits the screen top-bottom which is a bit easier on the eyes. You can change the brightness and zoom in and out on the image. I’m more likely to use Transcript on longer documents like wills. Reading through documents that don’t pertain to your family is a good exercise. It gets you accustomed to the handwritting and as you say, often gives you ideas of things to look for in your research. Hollie I didn’t see your reply until now. I also learned to write cursive first and with a fountain pen, inkwell and blotter! I know one blogger who took classes in the old German script writes her shopping list in Sütterlin. Well, Cathy, you’ve got me beat there! I did love fountain pens – but the kind with the little cartridge that you popped into it! That’s one of things that I spent my allowance on. 🙂 Very cool about the classes in German script! And a great way to stay in practice. Thanks, Hollie! This blog was very helpful. David and Elizabeth/Isabel are also in my direct lineage. David has many records in Beaver County, PA, around the late 1700s/early 1800s and beyond, but it is a blank slate before then. Any additional progress to report on this research? 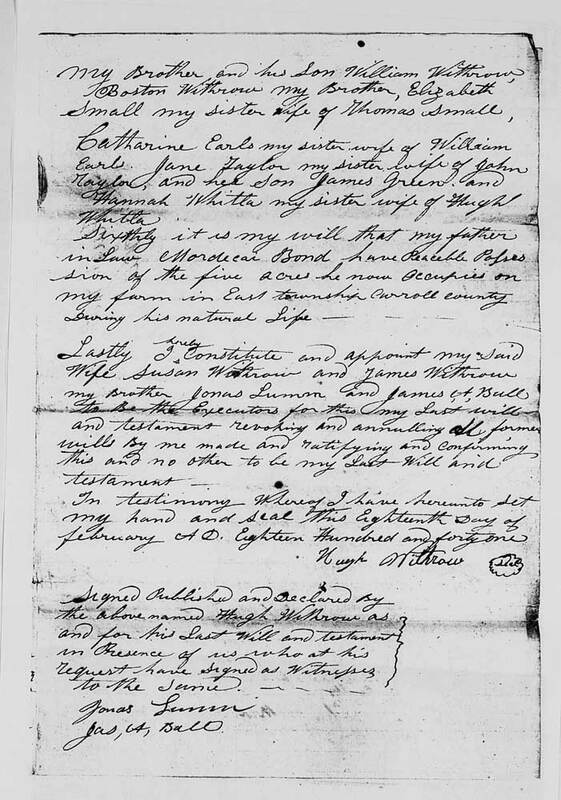 Can you tell me where you got the documentation on the marriage of David Withrow and Catherine Morrison? I searched the marriage records in Ohio and couldn’t find it.